My Review: Life with vampires is difficult for Sookie. She used to spend all her time trying to stay out of trouble, being one of the most seemingly boring people you could meet, until a vampire walked into Merlotte’s bar one day. And everything changed. Now Sookie can’t seem to stay out of trouble. I swear, every time you turn around, there’s Sookie in trouble again! 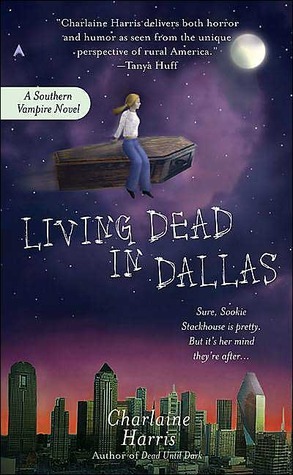 The second book in the series, like on True Blood, takes place mostly in Dallas where Sookie is helping to investigate the disappearance of a vampire. And while the show does operate in parallel with this book, there are enough differences in this one that it kept me much more entertained. There were times during the first book that I thought I was going to fall asleep because the TV show had mirrored it so closely. The second one did not suffer from this problem, and I liked it a lot more because of it. Some of the same issues that I had with book one, and with the TV series for that matter, remain in this book, mainly that Sookie is rather annoying at times, and Bill is just…ugh. I am so not a fan of Bill Compton. But there was a lot more Eric Northman in this book, and that is much more up my alley. Ladies – we get a good description of Eric wearing a lycra outfit. And since Eric is so yummy, well, it’s a pretty nice picture that I *wish* had translated over to television. Although we’re dealing with supernatural beings throughout much of this series, the book did raise some interesting questions I hadn’t thought about in awhile in relation to the show – particularly along the lines of persecution and hatred of a type of person for something that is out of their control. The Fellowship of the Sun, an anti-vampire church, is present throughout most of this book, and presents a somewhat sad mirror into what things can still be like in our society. The book is worth reading for the view of these fanatics, if nothing else, at least in my opinion. One complaint I do have is that from pretty much the start of the book, one of my favorite characters from the TV show, Lafeyette, is killed off. That was a little bit of a slap in the face, I almost thought it was a joke at first, and it did take me some getting used to. Even now, the knowledge that the book version of the series will have no more LaLa – it makes me want to cry a bit. I’ll miss you, love! This one is a significant improvement over the first book, but I will say that there’s enough back story needed that you shouldn’t just pick this one up. Read the series in order, you’ll thank yourself!